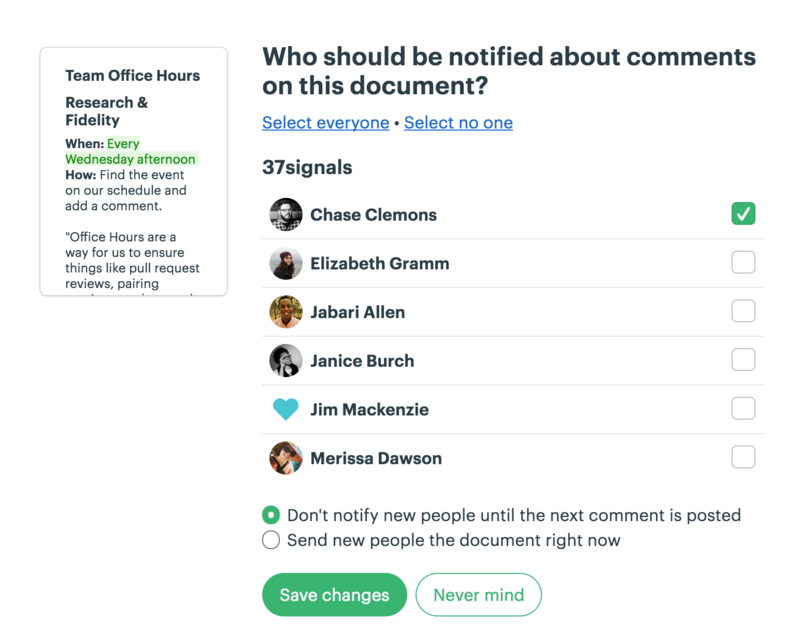 When you post a new item or a comment on an existing one, Basecamp 3 lets you choose which other people to notify. Click on the Add/remove other people link at the bottom of the page to send a notification alerting folks to new content. Tick the boxes next to people’s names to select whom to notify (or use the select everyone/select no one links up top), then select either the option to wait until the next comment is posted to send the notification, or send everyone the item right away. Hit Save changes, and that becomes the new default for who gets notified on any new posts to the thread. Campfire: Click the ••• menu in the upper right corner of the Campfire tool and then Notify me when people chat when you want to keep up with the conversation in any given project, team, or HQ. The counter next to Campfires in your Hey! menu will indicate the number of new posts to the rooms you follow. Click Stop notifying me in the same place when you no longer want to see those. Everything else: Anywhere you can add a comment (like to-do lists, comments on automatic check-ins, messages, and so on), you can elect to receive notifications for future posts to the thread by clicking the Subscribe me button at the bottom of the page. you post a comment on something, you’ll receive notifications on future posts to the thread. you type in a Campfire, you are automatically following that Campfire. someone assigns you a to-do, you'll be notified when anyone comments on it. you assign someone a to-do, you'll be notified when anyone comments on it, and when it's checked off.